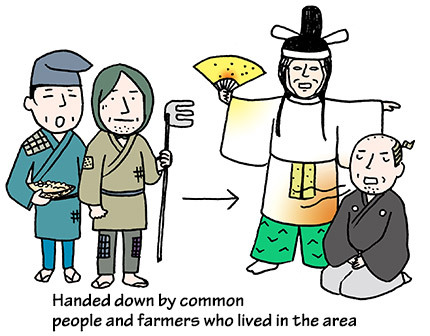 TRIVIA of Noh : Q130 : Tell us about unique Noh plays surviving in rural areas. | Home | Trivia | Q130 : Tell us about unique Noh plays surviving in rural areas. Tell us about unique Noh plays surviving in rural areas. Although the history of Noh has developed with links to central authorities since the age of Kan'ami and Zeami, some plays continue to be passed on in a different way. In the city of Tsuruoka, Yamagata prefecture, "Kurokawa Noh" is a form of ritual handed down for about 500 years at Kasuga Shrine, the guardian shrine of the Kurokawa district. It is descended from Sarugaku which was prevalent during the age of Zeami, with a similar repertoire of plays to those of the five major schools, including Kanze and Hōshō. It does not belong to any school, however, and retains old styles of programs and dancing forms that have already died out in the five schools. For example, a Kurokawa Noh actor assumes a unique posture with outstretched arms and pointing forefingers. It is said that the style traces back either to the days when Noh was born or to even older performing arts. Plays were performed by the common people and farmers who live in the local area. The folk art performed during celebrations at the shrine improved in quality under the protection of successive local lords. It then came to be performed individually and even came to have an influence in neighbouring areas. In May 1976, Kurokawa Noh was designated an important intangible folk cultural heritage of Japan.